Extensive research has been carried out on the association of cortisol levels and cognitive function but, to date, there is still little agreement on this relationship. Dysregulated hormonal balance and, in particular, impaired diurnal cortisol secretion is hypothesized as one of the underlying mechanisms for cognitive decline among the elderly. In this study, researchers conducted a cross-sectional analysis of 733 participants from the KORA-Age Study which examines the health status in people aged 65 years or older in the area of Augsburg, Germany. Cortisol levels were measured using saliva samples at three points: awakening, 30 minutes after awakening and evening. Cognitive status was determined by the telephone interview for cognitive status-modified (TICS-m). This study presents evidence for the relationship between cognitive function and blunted cortisol reactivity with advancing age. Thus, variability of diurnal cortisol secretion may provide crucial information for an underlying mechanism of cognitive decline. Furthermore, the ability to identify individuals who are most at risk for progressing to dementia is important to develop intervention strategies to combat reduction in cognitive performance. 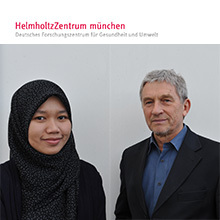 The aim of the Helmholtz Zentrum München is to develop new approaches for the diagnosis, therapy and prevention of common diseases. Other authors of the study include: Rebecca Emeny, Margit Heier, and Annette Peters of Helmholtz Zentrum München, Martin Bidlingmaier and Martin Reincke of Medizinische Klinik und Poliklinik IV, Campus Innenstadt, Ludwig Maximilians Universität München, and Maria Elena Lacruz of Martin Luther Universität Halle. For more than 20 years, the research platform Cooperative Health Research in the Augsburg Region (KORA) has been collecting and analyzing data on the health of thousands of people living in the Augsburg region. The objective is to elucidate the effects of environmental factors, behavior and genes. KORA focuses on the development and course of chronic diseases, in particular myocardial infarction and diabetes mellitus. Risk factors are analyzed with regard to individual health behavior (e.g. smoking, diet, exercise), environmental factors (e.g. air pollution, noise) and genetics. From the perspective of health care research, questions regarding the utilization of health care resources and the cost of health care are also studied.